Heritage Industrial Services, Inc. (Heritage) – a nationwide rigging and dismantlement contractor was contracted to perform a multi phased project which utilized Heritage’s multiple in-house capabilities and its ability to perform a total turn key project. Heritage was contracted by the client not only based on its competitive bid but on their safety record and ability to perform this work under a tight schedule. The project included the rigging and removal of juice and beverage equipment formerly of the Ocean Spray NJ Facility. 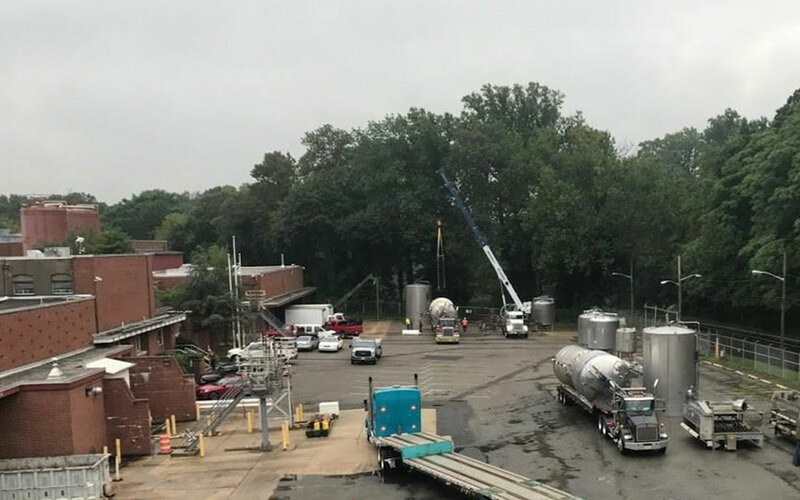 The facility was over 400,000 sqft in size and containing over 300,000 Gallons in S/S Agitated Jacketed Tanks, Aseptic Processing & Packaging, (2) Bottling Lines & (1) Can Line and Tanks Ranging from 500 Gal – 20,000 Gal Silos were auctioned off and sold. Prior to the start of work all electrical, steam, gas lines or other active supply lines were de-energized, isolated, capped and air gapped by the client. This allowed Heritage to mobilize and instantly start rigging and dismantling work from day one. After the above equipment removal was complete the next phase of the project started. The work included the removal from site of all items not previously sold, consisting of tanks, conveyors and other associated equipment items related to processing equipment. In addition, all associated piping, duct, conveyors and other items were removed that were not related to building infrastructure. The work was performed strategically in multiple areas simultaneously, including but not limited to the mechanical room, outside ammonia area, inside ammonia area, sugar tank room, water treatment room, conveyor room / bottling room and juice blend tank area. Due to our network of well-respected support companies we were able to provide higher scrap revenue and equipment asset recovery credits which were passed on to the customer to offset project costs during the second phase of removals. The following company owned tools and equipment were utilized thru-out the project including but not limited to various hydraulic gantries and rigging booms, multiple scissor-lifts, 12K capacity telescopic lull, various forklifts ranging from 5K capacity to 20K capacity, and Versa-Lift 25-35. Based on the complete understanding of and planned approach to the project, it was completed safely, on-time and within budget to the clients satisfaction.